Exodus 10:13- And Moses stretched forth his rod over the land of Egypt, and the LORD brought an east wind upon the land all that day, and all that night; and when it was morning, the east wind brought the locusts. Take your strawberry shortcake roll and leave it on the little cardboard piece it comes on. Add some green food coloring to your white frosting. Smear the frosting on the roll. Take 2 long pretzel sticks and put in a triangle shape on the side of the roll for his leg. Do the other side the same way. Break a pretzel in half and put in front on top for his antennas. Add two jelly beans for his eyes. You can let the kids actually make their own during children's church as a craft and recipe in one. They are sure to have a blast with this. 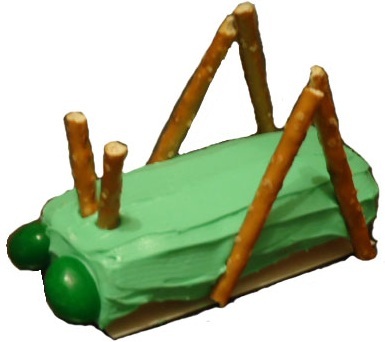 Teach the kids how grasshoppers were the 8th plague of Egypt that God sent. We have a lesson and other things to coordinate with this.